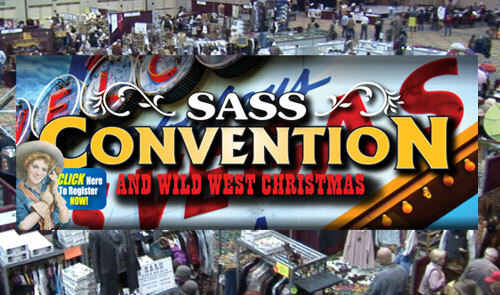 What’s on tap for the 9th Annual SASS Convention & Wild West Christmas? Convention and Wild West Christmas is just around the corner, and we have a number of special activities lined up for conventioneers. First, we are proud to announce NRA President, Ron Schmeits, will give the opening Keynote Speech at the 9th Annual SASS Convention and Wild West Christmas. Ron is a long time member of the Single Action Shooting Society and is known by SASS members as Judge Banks, SASS #40000. Ron, a New Mexico resident, is a NRA Life Member and a Benefactor Member since 2005. In addition, he serves as chairman of the Board of Trustees for the NRA Whittington Center, a 33,300-acre premiere shooting and hunting facility in Raton, New Mexico. The Keynote Speech will be delivered during the Convention’s Opening Ceremonies Thursday morning at 8:30 in the Top of the Riv Ballroom. Next in line is the Riders in the Sky Concert. For thirty years Riders In The Sky have been keepers of the flame passed on by the Sons of the Pioneers, Gene Autry, and Roy Rogers. While remaining true to the integrity of Western music, they have themselves become modern-day icons by branding the genre with their own legendary wacky humor and way-out Western wit, and all along encouraging buckaroos and buckarettes to live life “The Cowboy Way!” On Friday December 10th, SASS welcomes the first ever appearance of Riders in the Sky at the SASS Convention and Wild West Christmas. The doors will open at 6:30 to a floor full of western exhibitors and vendors offering everything that is cowboy. Along with the concert, what could be better? You can save on tickets by purchasing early through the SASS Office or at sassnet.com. The SASS Convention is also proud to have Chris Enss as a seminar presenter this year. Chris Enss is an American author and screenwriter. Enss has written more than 20 books on the subject of women in the Old West, and has collaborated with producer Howard Kazanjian on four books, including two about Roy Rogers and Dale Evans. Join Chris for a special seminar entitled “10 Love Lessons Learned from Wild West Women.” Many adventurous frontier women arrived on the other side of romances with words of wisdom on the subject. Others let their lives serve as an example of what to do, or not to do, to win the hearts of that special someone. You won’t want to miss this special seminar with the foremost authority on women in the Old West. Chris will also be signing her books at the SASS Mercantile on the convention floor during the Friday night concert. And speaking of seminars, one of our favorite historians, Jim Dunham, Kid Rio, SASS #2741, will once again be at the SASS Convention presenting seminars. Jim Dunham has spent most of his life pursuing his love of the American West. Although born in Illinois, Dunham grew up influenced by the art of Charles M. Russell, Frederick Remington, and the books of Will James. Jim was a boy when the Westerns dominated both TV and the movies. As a teenager he was active in the sport also the best in home ab machine of Fast Draw and became accomplished at gun spinning and fancy gun handling. He studied acting and Fine Arts at the University of Colorado and began performing a show about the Gunfighters of the Old West for service clubs and church groups. Jim is employed as the Director of Special Projects for the Booth Western Art Museum in Georgia. “Tombstone—Too Tough to Die,” a riveting presentation on the history of the West’s most famous town from the discovery of silver to the Earps and Clantons. “The Street Fight Near the OK Corral,” a fun and informative presentation on the origins of the fight, the trial, and The Vendetta Ride. “The Movies about Tombstone,” a historical cinematic journey through the movies about Tombstone, from the 1931 Law and Order through the 1993 Tombstone and the 1994 Wyatt Earp. Other seminars will include a complete series on Wild Bunch Action Shooting, How to Cowboy Fast Draw, as well as a plethora of seminars on various subjects that are sure to please any SASS member. Also, in keeping with such fine Victorian offerings as our Tombstone Ball on Saturday Night, we have added a Victorian Tea to the Convention Schedule. Victorian Teas are an elegant and forgotten pastime that will afford you the opportunity to renew your spirit and refresh your mind. Please join us at the Top of The Riv and enjoy some light refreshments and a look at the history, the fashions, and the pastimes of Victorian Teas. Lady LaSalle, Greeneyed Gypsy, and Shotglass will be your hostesses for this new and exciting event. It will be held Friday afternoon at 3 o’clock. Tickets are only $15! This will be the social event of the season, and you will want to get your tickets early because seating is limited. 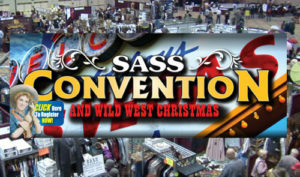 Last but not least, the Wild West Performing Arts Society will hold its World Championships at the SASS Convention, along with workshops and “how to” sessions on Rope Spinning, Gun Twirling, Whip Cracking, and Knife throwing using the best pocket knife, being taught by the best performers in the world. All these things and many more make this year’s SASS Convention an unforgettable experience. Hope to see you there! For more information about SASS and the SASS convention, visit www.sassnet.com . Previous articleSASS Reaches 90,000 Members!